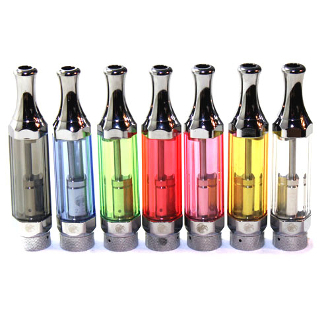 The Slim series clearomizer is a great new dual bottom coil clearomizer that has a unique hexagonal shape and a sturdy clear plastic tank that comes in a variety of colors: Clear, Black, Blue, Green, Red, Yellow and Pink. It can be disassembled and rebuilt which gives you the capability of not only cleaning your clearomizer but also removing burned out wicks and replacing them. It is also eGo 510 threaded which makes it a versatile clearomizer that will fit on any eGo battery. How To Fill: Hold the tank upside down with the drip tip facing down. Unscrew the bottom assembly from the tube. Fill with e-liquid by tilting the tank at a slight angle and dripping juice down the inside wall against the outer wall of the glass tank. Screw the bottom assembly back onto tube. Screw onto electronic cigarette device and you're ready to vape. How To Replace Wicks: Hold the tank upside down with the drip tip facing down. Unscrew the bottom assembly from the tube. Unscrew wicks from the base and replace with new ones Screw the bottom assembly back onto tube. Screw onto electronic cigarette device and you're ready to vape.